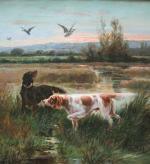 Hunting painting by French hunting and flower painter Eugène Petit (1839–1886). He was born in Paris in 1839. He briefly taught the American painter Henry Woodbridge Parton, ca. 1875. 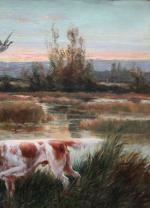 He specialized in still life paintings of flowers and fruits, as well as sporting and hunting dogs. His work has been found in museums in Carcassonne, Compiègne, Courtrai, Rouen and Saint-Etienne in France as well as The Sladmore Gallery in London. Some of his work has been auctioned at Bonham / London and Dorotheum in Vienna. Literature: Thieme/Becker "Allgemeines Lexikon der bildenden Künstler von der Antike bis zur Gegenwart" (in German); Benezit (in French). Technique: oil on canvas. Original gilt frame.